This TV had no power at all and no standby voltage. 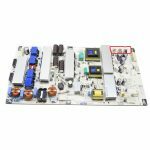 There is a repair kit available for the power supply board DPS-411AP-1 at Shopjimmy. 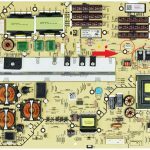 There is a service manual online but no schematic for the power supply board. Advice on badcaps suggested looking at the circuitry around IC901 (ICE3BS02G) which generates standby voltage as a separate circuit from the incoming AC. Components to check include F2 (small red fuse), R929, R903 and Q905. R929 was open and I replaced it with a 2.2ohm 1/4 W fusible resistor. It blew when I plugged it in and there was also visible damage on IC901. I tested Q905 on my ESR tester and it was not shorted. ICE3BS02G is obsolete but the manufacturer lists ICE3BS03LJG as a replacement and this part was available at Digikey (part #ICE3BS03LJGXUMA1CT-ND). I also ordered a 1 ohm fusible resistor to replace R929 (Digikey part #1.00DCCT-ND). When the parts came in, it was difficult to find the pin 1 marking on the IC. Taking a pic of it, you can see it on the bottom left with the markings upright. With the two parts replaced, the TV powered up.